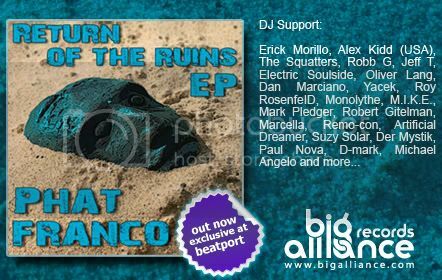 Big Alliance Records is back with another gem from the hands, heart and soul of up and coming producer from Argentina, Phatfranco.On this EP you will find Electro house at its best, with two originals from Phatfranco entitled "Return Of The Ruins" and "Disco Lover" that will cause some stir in clubs and Radio stations alike! To complete the EP, Big Alliance enlisted Djs/Producers Cold Blank who have been red hot with their latest releases on Potty Mouth, Plasmapool and Burn the Fire and UK Producer Dan Thomas, whose remix of "Old Skool Filth" has been riding high on the Beatport charts. Sure to be a package to be included in your collections and sets! Erick Morillo, Alex Kidd (USA), Mark Pledger, Santiago & Bushido, Der Mystik, The Squatters, Breakdown, Stupid Fresh, Robb G, The Bulgarian, TJR, Hot Mouth, Aniki, Alex Dreamz (KIIS FM DJ), Mikey Dalton, Electric Soulside, Ray of Bugeyed, Jeff T, DJ Kue, Reid SpeedThe Squatters, Dan Marciano, Oliver Lang, M.I.K.E, Robert Gitelman, Coco Ariaz, Monolythe, Yacek, Marcella, Remo-con, Artificial Dreamer, Suzy Solar, Paul Nova, D-mark, Michael Angelo and more.